It doesn’t take long to realize your wedding stationery provider does more than just your wedding invitations- there are save the dates, programs, menus, place cards, and all manner of signage to consider. It can be overwhelming to say the least, which is why I am so excited to speak to wedding stationary expert and all round cool chick Katie from Basic invite! Katie! Thank you so much for being this week's event guru! I have a few questions here from some curious brides who are feeling a little overwhelmed about Wedding stationary. I’ve been with Basic Invite going on three years and love being a part of both the wedding and stationery industries! It’s an amazing opportunity getting to know other folks in the business as well as helping customers find and create the perfect piece of stationery to help celebrate whatever special event is going on in someone’s life. My role is connecting with other industry professionals to collaborate on creative content that results in not only partnerships with photographers, vendors, venues, etc. but that provides helpful resources for brides and couples planning weddings as well as anyone looking to celebrate a major life moment! I also keep up on our social media platforms offering up invitation inspiration and connecting with real brides and customers on the daily. That truly depends on the size of the wedding, the paper products a couple decides they need and the type of invitation they opt for. With that said, the average cost of wedding stationery for our couples ranges from $600-$900, that would be everything from save the dates to thank you cards. Customizations (foil, envelope colors, liners, etc. will all increase the price). Number of enclosure cards (rsvp, ceremony, reception, etc.). Quantity ordered (the more you order the less each individual invitation costs). Save the dates should be ordered 6+ months prior to the wedding and sent out 4+ months prior to the wedding. Followed by ordering wedding invitations 4+ months prior and sending them out 3+ months prior. Couples should give guests ample time to RSVP. Give them up until two to three weeks before the wedding day to respond. This will take pressure off of your guests to rsvp immediately, giving them time to check their schedules, And it will leave you, the couple, enough time to finalize seating arrangements and provide the caterer with a final headcount. Ask us anything! When it comes to all things paper, color, design, wording, invitation etiquette and wedding timelines we have the answers! Basic Invite offers a live chat feature on our website and we encourage anyone shopping for stationery to utilize it! And you can always give us a call or hit us up on social media at @basicinvite. We also offer designer assistance where one of our invitation experts will look over your final product before it goes to print. They will make sure the layout, design, spelling and colors are all perfect so that you don’t have to worry. Order samples! 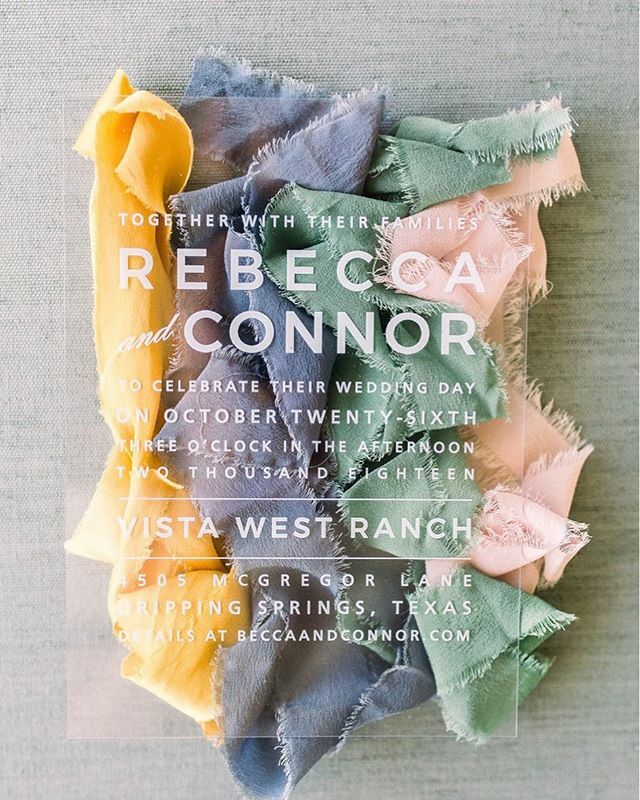 Start the wedding stationery process early, about 8+ months out, to give yourself time to shop around, play with fonts and colors, and really get a feel for the look you’re going for. Once you’ve narrowed down your options order custom samples to get a real life look and feel at your invites and choose the one perfect for you! Matching your invitation design to your wedding colors or theme is a simple way to keep your wedding look cohesive and your vision clear. Absolutely! We offer 180+ color choices, multiple paper types including clear and real wood, different card cuts, raised and flat foil and so much more! Ordering custom samples of some of your favorite designs will reassure you that our products are high-quality as well as help you make a final decision on the look you’re going for. Again, starting the invitation process early will unburden you from rushing on a last minute design. Planning a wedding is hard, but creating your invitations shouldn’t be. Have fun with your invites! Add personality to your design and enjoy the process. Seal and Send Wedding Invitations are going to be the number one trend next wedding season. Our Seal and Send Invitations are an all in one wedding invitation and tear-off RSVP card that fold up into a pre-printed envelope and sealed with a custom sticker. These are cleverly practical and an innovative design that couples already love! And although we rolled out our Clear Collection a while ago brides are just starting to jump on this trend too. Katie, you’re amazing! Thank you so much for putting the time and effort into answering Dancing & Dessert's questions! Do you have any other questions for me or Katie? If you do please comment below, we are always here to help you plan the best damn party!